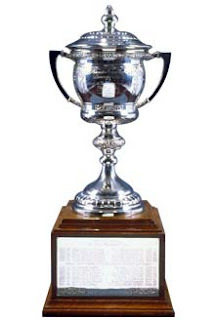 The Masterton trophy in all of its glory. Nah, just kidding, this is the Lady Byng. Admit it, you didn't know. The eyes of the hockey world turn to ... Las Vegas? Again? Come on, NHL, stop trying to make this happen... tonight for the annual NHL Awards. And while Sens fans have largely focused on the Norris and the Calder, where Erik Karlsson and Mark Stone hope to bring home some hardware, a third Senator is up for recognition: Masterton nominee Andrew Hammond. Is he going to win? Probably not. Fellow nominee Kris Letang had a hole in his heart, people. A HOLE IN HIS HEART. But wouldn't you like to know what Hammond would say if he did pull of the upset? The RBM crew has your back, kids. Turns out that our sparking insight and witty turns of phrase haven't gone unnoticed by Senators' personnel as Hammond himself reached out and asked us to prepare his speech for him. Hear that, Dellow? It's not just you stats junkies that get work in the big show! Anyway, Hammond may be good at stopping pucks and warming hearts but he's terrible at reading the fine print in hastily-drafted employment contracts. Should've asked for exclusivity, Andrew. Here is your exclusive first look at what Hammond will say if he's handed the hardware tonight in Vegas. Ladies and gentlemen, professional hockey writers, let me start by thanking each and every one of you. This is a real honour for me. Even going back to my college days, I was never the Big Mac on campus. I've always had to work McDoublely hard to get where I am today and it's nice to have that work recognized. Looking back on the incredible run of the Senators this year, I'm overcome by a McFlurry of emotions. I felt like a bit of a Filet O'Fish out of water when I took over the net - Andy and Lehner have always been great to me and it was hard to see them get hurt - but the team never looked at me like a small fry. Some have said we must have had Shamrock Shakes in our locker stalls; that our run was simply a lucky break. But we hash browned it out internally and we knew that if we went out there with a Big Breakfast in our bellies and Quarter Poundered our opponents, we'd McWrap up some wins and leave our doubters Grimacing in the corner. It's that sort of McNugget of wisdom that made Coach Cameron such a success. So thank you once again. I know that Letang and Dubnyk feel robbled right now but they deserve this award just as much as I do. It's a Super-Size honour to be nominated with you, fellas!